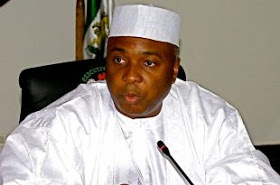 The president of the Senate, Bukola Saraki, has advised President Buhari to order his security chiefs to immediately produce quick response measures to deal with the avalanche of murders in Nigeria. According to a statement from Yusuph Olaniyonu, special media and advertising advisor in Abuja, Saraki said it was important for Nigerians to begin to have assurances that the government was "decisively responding to the current threat to lives and property in parts." of the country." "I am very sad to hear the news of the incident in the state of Plateau, which is very depressing and gives the impression that the country is not safe." The problem of Boko Haram in the northeast is well known to all, but this murder perpetrated by unknown gangs of assailants in the states of Benue, Taraba, Plateau and Kaduna is now giving another dimension to the crisis. "Arriving at the time we are preparing for the elections, we must respond quickly." If the plan is to develop some long-term measures, we also request that the president order the security chiefs to present an immediate measure of immediate response. Short term that will restore confidence in the system and demonstrate to the criminals behind these murders the ability of the government to address the problem. "We have to immediately design a plan through which the criminals behind the murders and their sponsors can be trapped and made to face the wrath of the law." We also have to develop plans to clean up illegal firearms in the hands of the elements. dangerous and at the same time stop the entry of these weapons into the country. "